Join me every week for Win-It Wednesday, with 24-hour giveaways just for you! What happens when the Easter Bunny wants to become a drummer instead of delivering Easter baskets and hiding eggs and he runs away to Hollywood? Find out in HOP, the new movie by director Tim Hill of Alvin and the Chipmunks and producer Chris Meledandri’s Illumination Entertainment who brought you Despicable Me. HOP opens April 1st! 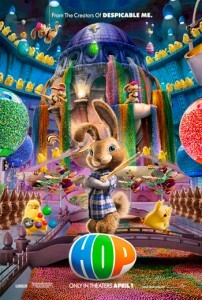 When the soon-to-be-appointed Easter Bunny, E.B., takes off for Hollywood to pursue his dream of becoming a drummer, he is hit by a car, driven by out-of-work slacker Fred, who is forced to help him save Easter before the chicks take over. To enter, tell me if the Easter Bunny visits your house on Easter. 1. Leave a comment. Does the Easter Bunny visit your house on Easter? 2. Join the HOP community and the Deal Seeking Mom community on Facebook for more conversation, additional deals and a peek at the freebies I receive in the mail each week. Come back and leave a separate comment letting me know you’ve done so! 3. 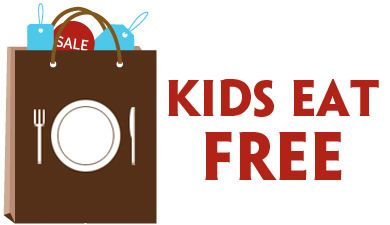 Follow @DealSeekingMom and @ebHop on Twitter and tweet the following. Be sure to come back and leave a separate comment with the link to your tweet! 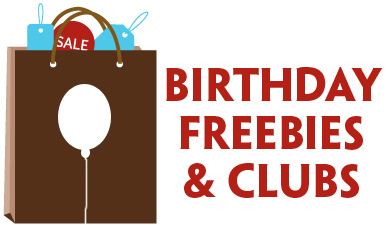 This giveaway ends at 7 p.m. EDT on 3/24 and is open to all U.S. residents 18 years or older. I’ll use And the Winner Is to select the winning comment. Winner will be notified by email and listed on my Giveaway Winners page. Winners must respond within 48 hours of notification to claim their prize. Good luck! I’m an email subscriber at coriwestphal at msn dot com. 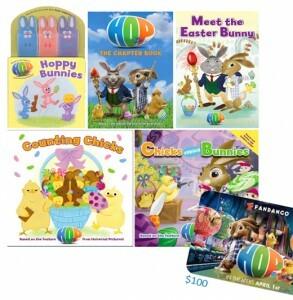 The Easter Bunny comes here and these books would be a great addition to the baskets he leaves. Thanks! the Easter bunny comes every year… and sometimes his gifts are small and hidden… sometimes they are piled high i the middle of the table! Either way – smiles all around! I am always grateful for your emails. I follow you and ebhop on Twitter and tweeted the giveaway. I am also an email subscriber. :) Thanks for the awesome giveaways! Yup, the Easter bunny visits our house! Yes the EB comes to our house. One time he left glittery/powdery footprints all over the house. Yes. The Easter Bunny stops here. Did you not see the sign by the front porch that says that??? (tee hee) Easter is my very favorite holiday. I’m a fan of HOP & DSM on facebook! I subscribe to the DSM email newsletter. The Easter Bunny comes to my house. Following DSM and HOP on Facebook! yes, the bunny has visited our house the past 10 years! follow DSM and Hop on facebook! Yes!!!!!! The Easter Bunny visits our home…so much fun!